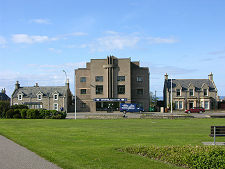 Lossiemouth can be found on the Moray coast some five miles north of Elgin. 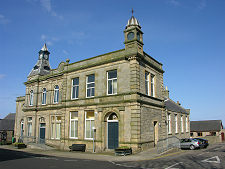 The town owes its existence to Elgin's need for a port to service its trade. 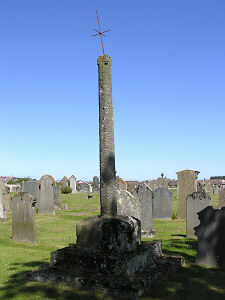 For many centuries this role was fulfilled by Spynie, two miles north of Elgin. This is now only known as home to Spynie Palace but until the 1500s the sea came as far inland as the high ground there. A series of storms led to a build up of sand and shingle that blocked the entrance to Loch Spynie, most of the rest of which has now been drained. 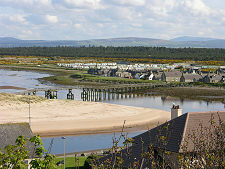 An alternative port was therefore developed in the mouth of the River Lossie. This port operated successfully for several hundred years, but the major development of Lossiemouth did not take place until the 1800s. 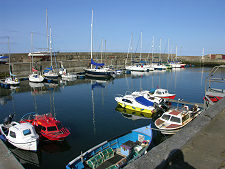 In 1835 the Lord of Pitgaveny opened a small harbour in what is now the north end of the yachting marina. This surrounding area became known as Branderburgh, to distinguish it from the small village of Stotfield, a little further to the west. 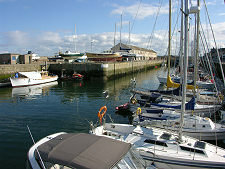 Branderburgh Harbour was designed to carry the commercial traffic that until then had relied on the mouth of the River Lossie. At around the same time, Seatown was built a short distance inland along the River Lossie. 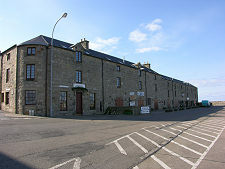 Its 51 cottages were intended to provide accommodation for the fishermen, who continued to use the river as their harbour. Seatown was sometimes referred to as the Dogwall, a reference to dog-skins that were dried here before being turned into floats for nets. 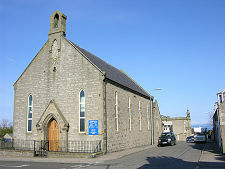 Branderburgh grew in the latter half of the 1800s and as it merged into Seatown and Stotfield, the area came to be called Lossiemouth, or simply Lossie. The harbour on the east side of Lossiemouth was extended at the time of the coming of the railway link from Elgin; and at about the same time the fishing fleet started to move from the river to the harbour. On 12 October 1866, Ramsay MacDonald, later to become Britain's first Labour Prime Minister, was born in Lossiemouth. Lossiemouth harbour continued to be developed. A major setback came when the North Pier was washed away in 1936, but it was soon replaced and a further basin inside the North Pier was added as recently as 1957. Today's Lossiemouth has seen many changes. The eastern harbour has been converted into a spectacular yachting marina, while the railway sheds that used to service it have been swept away in favour of harbourside houses and flats. 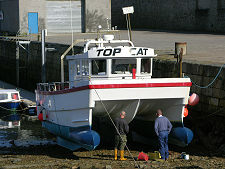 The northern harbour continues to protect vessels of all shapes and sizes; and there remains a resident fishing fleet and a fishmarket there. 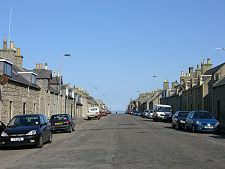 Lossiemouth grew on a grid pattern combining many small fishing cottages either side of some strikingly wide streets such as Commerce Street; plus a few grander buildings like the library and the three story harbourside block that now houses the fisheries museum. You'd tend to describe Lossiemouth as "organised" rather than "pretty" but it does have a welcoming atmosphere. 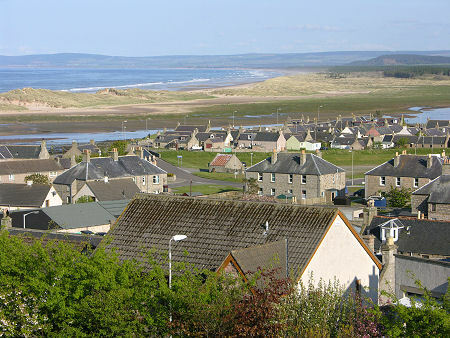 Lossiemouth has more to offer than its harbours and the regular plan of the town itself. Visitors can also enjoy two superb beaches here. One, West Bay, stretches for three miles to the west, beyond the headland housing Covesea Lighthouse. 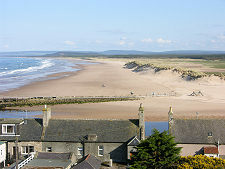 The East Beach extends even further to the east of Lossiemouth. It begins with the spit of sand and dunes backed by the length of the River Lossie as it parallels the sea before emerging in Lossiemouth. It is reached by pedestrian bridge from Lossiemouth. The dunes backing the East Beach were created deliberately in the early 1900s by placing disused railway carriages behind the beach. The intention was to provide better protection for the Seatown length of the River Lossie. 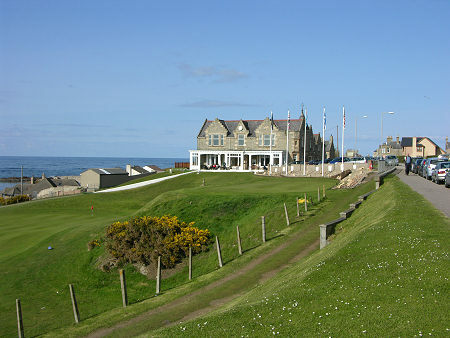 Lossiemouth also offers visitors a range of golfing opportunities, including the Moray Golf Club on the west side of the town, overlooking the West Bay. Also on the west side of the town are the landing lights signifying the end of one of the runways of RAF Lossiemouth. 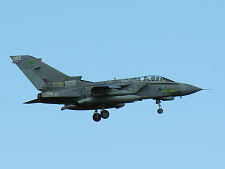 The RAF station opened in 1939 and has since become an integral part of the local community, these days providing a home for several squadons of Typhoon aircraft. Evidence of an earlier resident can be seen as you drive along the A941 Lossiemouth road leaving Elgin. 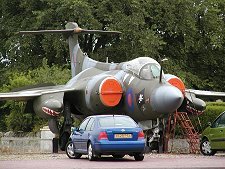 At a garage on your right you are greeted by the sight of a Buccaneer aircraft parked on the forecourt, one of those replaced at Lossiemouth by the current Typhoons.